In a pattern it is necessary to abbreviate loom knitting stitches or any kind of knitting or crochet for that matter. It condenses the pattern down and makes it a shorter read. After you get used to loom knit abbreviations it will be second nature to read that and remember what it means. We have compiled the following to help you reference what the loom knit abbreviations mean. If a detailed article is written on the technique or stitch, the loom knit abbreviations will be a hyperlink; please hover and click. We are working on articles for these but not all loom knit abbreviations will get one because they are self-explanatory and can be found in other places on our site. 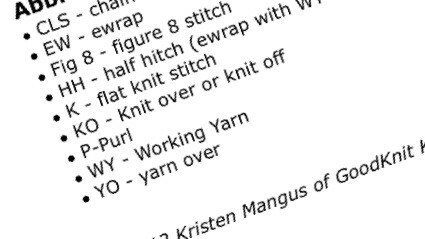 This is a Quick List of loom knit abbreviations. k1b = knit 1 in the row below. k2togb = Knit 2 stitches together through back loop (is k2tog using ew stitch). k3togb = Knit 3 stitches together through back loop (is k3tog using ew stitch). Kfb = knit in front and back of st.
p1b = purl through the back loop (purl as usual but twist when replacing loop). p2sso = pass 2 slipped sts over. p2tog = purl 2 together. p2togb = purl 2 together in back (purl 2tog as usual but twist when replacing loop). p3tog = purl 3 together. Rev St st = reverse stockinette stitch (purl side is right side). S2KP or S2KP2 = slip 2 stitches together, knit 1, pass two slip stitches over. sk2p = Slip 1, k2tog, pass sl st over. skp = slip 1, knit 1, pass slipped stitch over. slip1-k1-psso = slip 1, knit 1, pass slip stitch over. WS = wrong side (if translating needle patterns use opp. stitch on these rows p = k, etc.). 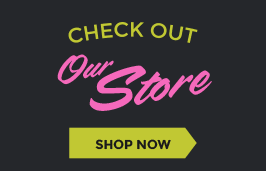 Please note that the GoodKnit Kisses Resource library is endeavoring to expand this section with descriptions, definitions, videos, pictures and swatches. We have several test swatching opportunities available if you would like to participate on needles, knitting loom and crochet. Please use our contact form should you wish to participate. Let us know which (needles, loom, hook) tool or tools you prefer and your level. If we have missed loom knit abbreviations that you want to see, let us know!